Various state and local officials cut the ribbon for the new Route 926 bridge. From left: State Rep. Carolyn Comitta (F-156), a local vet office mascot, Chester County Commissioner Chair Michelle Kichline, State Rep. Steve Barrar (R-160) and Unionville-Chadds Ford Superintendent of Schools John Sanville. 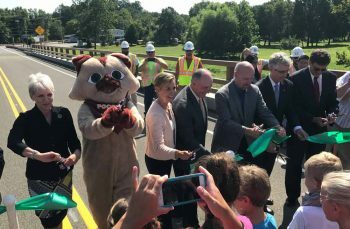 POCOPSON — More than 100 people showed up to celebrate the early opening of the new Route 926 bridge over the Brandywine Friday morning under bright, sunny skies — and a lot of praise for virtually everyone involved in the project. The new bridge — which should be open for traffic by this evening — is a three span bridge, located at a higher elevation, to prevent flooding issues. Additionally, some 1,700 feet of roadway has been raised and a pair of small culverts in Birmingham were replaced by larger, arched culverts to improve water flow at flood stage. The old bridge was built originally in 1937 and rehabbed in 1974 — but in recent years due to structural deficiency, had seen its weight limit fall in recent years. With school starting Monday, having the bridge open by this weekend will ease transportation issues for the first week of the school year — the original deadline was Sept. 1. “The completion of this new bridge will help boost local economies and bring enormous benefits to thousands of motorists, cyclists and pedestrians on both sides of Brandywine Creek by providing safer and more reliable travel,” PennDOT Assistant District Executive for Construction George Dunheimer said. Dunheimer gave credit to Clearwater Construction — the project contractor — for getting the job done well and early. Pocopson Township Supervisor Elaine Di Monte noted how impressed she was with the professionalism of Clearwater and how well they interacted with both the township and local residents. Supervisors chair Ricki Stumpo noted there had been very few resident complaints about the project — which was completed in just eight months. That shorter timeline came when area residents — in part pushed by Unionville-Chadds Ford Superintendent of Schools John Sanville — objected to the previous plan for it to take 18 to 24 months to complete the work. State Rep. Steve Barrar (R-160) — who had worked to get the bridge replaced since 2002 — said his office was inundated with emails pushing for a shorter build time. When Barrar passed on the some 500 emails, PennDOT listened and proposed a new, much shorter build time with penalties for construction running late. Barrar credited PennDOT and Clearwater for how smoothly the project went – comparing it another PennDOT project Barrar has spent more than a decade pushing for: the widening and rebuilding of US 322 in Concord and south. “I pray to God that the 322 project goes as smoothly as this one,” he said. State Rep. Carolyn Comitta (D-156) who represents the Birmingham side of the bridge, called the new span “beautiful” and expressed excitement that so many local residents had come out to see the new bridge and celebrate its opening. She noted one thing she has learned since taking office in January: PennDOT gets a bad rap sometimes. 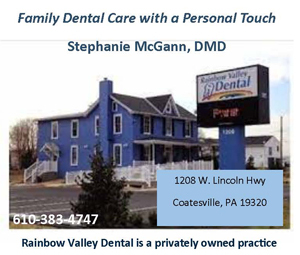 “PennDOT really is on the cutting edge of technology to better serve the people,” she said. Chester County Commissioners Chair Michelle Kichline echoed Comitta’s suggestion that the new bridge is “beautiful” — noting that it well suits its placement, with the design’s emphasis aesthetics and function. “The community should be really proud of this bridge,” she said.